Pandit Gajananbuwa’s Legacy. What is legacy? Dictionary meaning of the word ‘Legacy’ is ‘something handed down by a predecessor’, ‘A gift’. To get a better insight in the meaning of the word ’legacy’ here are some quotations by some thinkers. Shakespeare the greatest literary artist said: “No legacy is so rich as honesty”. (His play - All is well that ends well) Pandit Gajananbuwa’s life in music and his music in his life was a shining example of honesty. Everything he did in music as a lifelong learner, a disciple of four Gurus, performer of the Gayaki of three Gharanas, a Guru in teaching his disciples he was honest, truthful, and sincere. There were no gimmicks in his music making and there was no showmanship in his performances. He remained loyal and truthful to the Gayaki he learnt from his Gurus despite being creative. Surely honesty was Gajananbuwa’s one legacy. Another writer David Brower said: “We must begin thinking like a river if we are to leave a legacy of beauty and life for future generations.” What did Buwa leave for the next generations? Buwa generously taught and trained his disciples – in some cases without taking any fee. These disciples are now leading musicians performing Buwa’s Gayaki that they learnt making sure the tradition of the Gharana Gayaki continues. The disciples are also Gurus in their own right. The river of the beauty of Buwa’s Gayaki continues to flow with vigour and strength through his disciples and disciples of Buwa’s disciples! The list of Buwa’s disciples reads like the names of the major musicians of the present and past: Vocalists: Ulhas Kashalkar, Arun Kashalkar, Jayshree Patnekar, Padma Talwalkar, Shubhada Paradkar, Kaushalya Manjeshwar, Vikas Kashalkar, Veena Sahasrabuddhe, Shaila Datar, Ashok Ranade, Madhukar Joshi, Sucheta Bidkar, Apoorva Gokhale and Pallavi Joshi. Violinists: Shreedhar Parsekar, Datarji, Gajanan Karnad. G H Hardy one of the great mathematicians who discovered the genius of the Indian Mathematician Shreeniwas Ramanujan said: “Ambition is a noble passion which may legitimately take many forms; there was something noble in the ambitions of Attila or Napoleon; but the noblest ambition is that of leaving behind something of permanent value.”― G.H. Hardy, a Mathematician's Apology Pandit Gajananbuwa left three things of permanent value: 1. His own example that would inspire any one. What was it? After losing/breaking his voice in his teens he practiced tirelessly and rigorously to shape his voice. Keshavrao Bhole, P L Deshpande and Chhota Gandharva among others have paid tribute to Buwa’s sheer commitment and awesome hard work to regain the quality of his voice. Buwa’s disciple Padmashree Ulhas Kashalkar says: “It is true he did not have a great voice - the kind that wins a listener straight away; he did not have the honeyed voice like Pandit D V Paluskar or Pandit Kumar Gandharva, but despite its rather crusty timber it was very Sureela and extremely tuneful. With relentless riyaz he infused such resonance and taasir (emotive appeal) that his singing attracted everyone. I went to train with him in 1975; he was in his mid 60s then but even at that age he did his riyaz religiously 2. Aundh Music Festival: Buwa’s father Antubuwa started a music festival in the memory of his spiritual Guru Swami Shivanand in 1940. Gajananbuwa continued this tradition. The Oundh Music Festival continues to go from strength to strength every year. 3. However Buwa’s greatest legacy that has a permanent place in Hindustani Classical Music is his introduction of Violin to the Hindustani Classical Music. 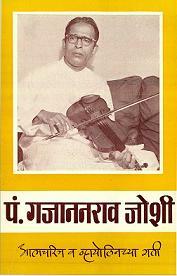 He was the pioneer in establishing a close performing relationship between Hindustani classical music and the violin. In addition it was Buwa who gave a permanent place to violin recitals of Hindustani classical music on the concert stage. Dattaji and Bacchubhai.